Developing a budget can take years for governing agencies to complete. The process is long and involved, with many details to research, examine and decide upon. New programs are considered; older programs may be dropped. Decisions will be made that affect a few dozen citizens – or a few million. A proposed budget is usually designed by a budget committee. The committee staff works hard to get things right. But even in this era of transparent government, many decisions must be made behind closed doors – not from an attitude of secrecy or a desire to keep things hidden, but simply because the public cannot be there, day after day, to look over the shoulders of the budget staff as they make thousands of decisions over the months. By the end of the process, with all the hard work the staff has put into the project, the last thing they want is a loud outcry of protest when the budget is presented to the public. To prevent unwelcome surprises at the end, many governing agencies will hold Town Hall meetings throughout the process, to present their proposed budget to the public. The meetings are open, and the public is invited to attend. The budget committee would be delighted if every person affected by the budget would come to the meeting. Budget staffs welcome input from the public. When citizens have a chance to get a preliminary look at a budget, they have a chance to provide feedback: they can suggest items to include on the budget; voice opinions about programs to delete; and feel like they have a say in their governing body. Final decisions may not always go their way, but they will at least have had a chance to participate in their democracy. 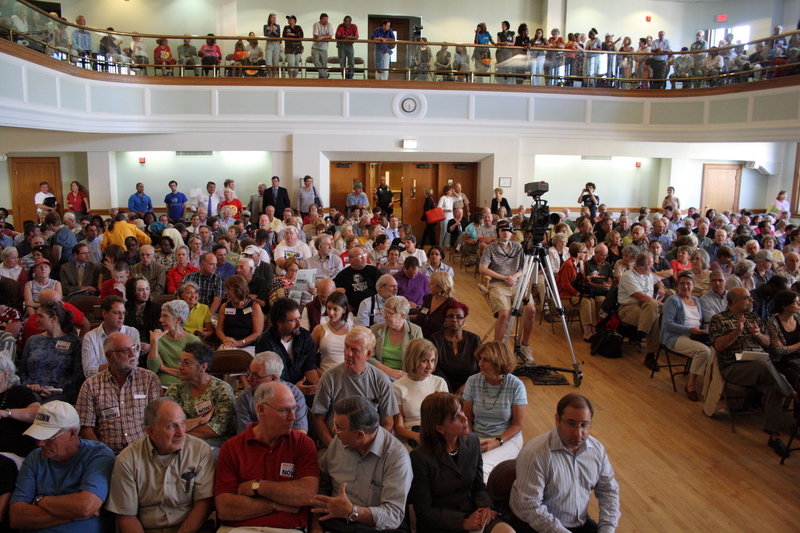 Town Hall budget meetings can be a great idea – when everything goes right. But there are pitfalls that can make the process too expensive, ineffective, or derail it in other ways. A series of meetings can be expensive – If residents in an area have to travel too far to go to the meeting, they simply won’t come. To solve this problem, the budget might be presented at a series of town hall meetings, in different locations around the area. Holding multiple meetings can be expensive, though. Feedback is also delayed, as the meetings must be scheduled one after another, with days or weeks in between. Seasonal residents may be gone – It does no good to hold a town hall meeting, if half the population is gone for the season. They simply will not return for a town hall meeting, no matter the topic. Nobody shows up – Even if most of the residents live nearby; and it’s the right time of year for them to be close; they still might not show up. 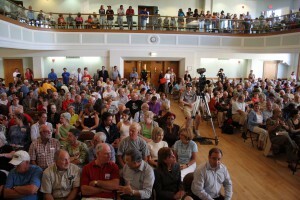 For a Town Hall meeting to work, the town must show up! But with many competing events, people will often choose not to attend. More and more governing agencies are addressing these problems by broadcasting their town hall budget meetings online. When you partner with TikiLIVE to live stream video of your meetings, you’ll be teaming up with an experienced company that will reliably broadcast your meeting to all of those citizens who can’t be there in person. TikiLIVE is a leader in live streaming video over the internet to viewers anywhere in the world, anytime. With our years of experience, we offer many advantages. All of the expensive hardware and network equipment is operated and maintained by TikiLIVE. All you need is a computer and a camera. To get started, download the free software from TikiLIVE. The software is intuitive and easy to use. It will guide you through a few easy steps, during which you will connect your camera to the computer, and configure your TV channel. In no time at all, you’ll be up and running. Broadcast live to computers, televisions, tablets – even smart phones! Your residents are on the move, and many of them probably access the internet from their smart phones more often than they do from a computer. TikiLIVE can include HTML5 encoding in your video, which means the video can then be live streamed right to your residents’ mobile devices. They can participate in the Town Hall, even when they’re on the go. Many people prefer to keep up with events through Facebook. With TikiLIVE, a window can be configured on their Facebook page, allowing them to watch the budget meeting from within Facebook. When you get started with TikiLIVE, you can configure your channel to include a live chat window. During the town hall meeting, distant viewers can ask questions, and you’ll be able to answer their questions while the budget meeting is in progress. Once you’ve used TikiLIVE to set up a channel for your organization’s town hall budget meeting, you’ll be able to use the channel for other purposes, too. For example, you can schedule regular webcasts, and live stream other important meetings. It’s never been easier to update citizens, present budget material for review and comment, and gather public input. Live streaming through TikiLIVE’s network gives you a unique opportunity to speak directly to the public, and give them information in advance about budget decisions that may affect them for years to come. Get Started with TikiLIVE and Live Streaming – Today! For more information about TikiLIVE, and to find out how you can set up a live feed of your next town hall budget meeting, call us today at (305) 289-4557. You can also start an online chat with one of our knowledgeable representatives. We’ve worked with other government agencies, and our customer service representatives will be happy to explain more about how we can help you reach members of your area.